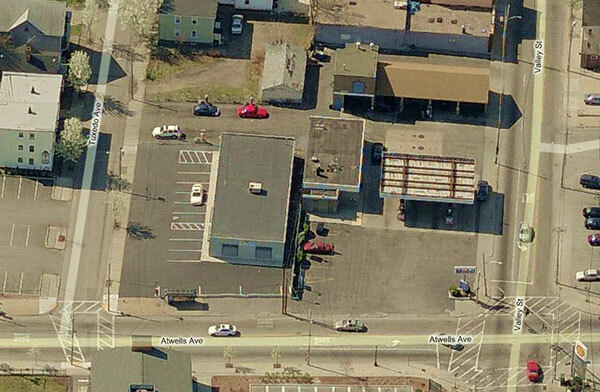 At their November 13th Meeting, the Zoning Board of Review will consider a request for a drive-thru at the gas station site at the corner of Atwells Avenue and Valley Street, across from Eagle Square shopping center. Subject property fronts Atwells between Valley and Tuxedo. Image from Bing Maps. RTJM, LLC: 259-269 Valley Street, 268-280 Atwells Avenue1 & 13-15 Tuxedo Avenue, also known as Lots 532, 533, 580 & 583 on the Tax Assessor’s Plat 33, located in a General Commercial C-2 Zone; the applicant is seeking a dimensional variance for relief from Sections 409 (requirements for retail gasoline fueling facilities) and 607.3 (provisions for signs) in the proposed modernization of the existing retail gasoline fueling facility with retail uses, and a special use permit pursuant to Section 303-Use Code 57.2 in order to provide for a new drive-in window. The lots in question together contain approximately 28,550 square feet of land area. The lot with the gas station on it has already been cleared, the car wash on Valley Street and the building facing Tuxedo Avenue remain. The Zoning Board of Review meets on Tuesday, November 13, 2012 at 5:30pm at 444 Westminster Street. 1The Atwells address above is wrong, it is on Federal Hill and not contiguous with the parcels in question on Valley Street and Tuxedo Avenue. I just walked across that lot yesterday during the storm and thought it silly that they tore down the building, dug out the storage thanks and then paved the entire lot over. That image is also a bit dated, as the car wash now extends through to Tuxedo, with asphalt covering the area with the white building and the red and blue cars to provide vacuuming stations. Do those lot references include the “Jewelers Supply Corp” building (the white one in the lower left)? Going through here everyday to get to work on either foot, transit, or bike, I have to think that adding a drive through that adds any significant volume or more complicated traffic movements to that intersection’s traffic is not a good idea. The curb cuts for the station were already much abused by being practically part of the intersection. The gas station’s going back. DEM is requiring all gas stations to remove their old USTs and put “leakproof” ones in. Not sure what the “drive-thru” portion is for, but might be for a combined coffee/donut place like some Shells have. Pretty sure the car wash is coming down as well. Does not include the Jewelers Building. Whew… I saw Atwells and though it meant up on the hill more… the traffic there is ridiculous, I can’t imagine adding in a drive thru. That lot would be fine though. It’s an ample lot, and the traffic controls on that corner would handle things well. Though honestly…. I kind of like it quiet like it is now. I walk by there all the time, and it’s nice not feeling completely bullied by cars on that corner. Car wash is coming down..smaller gas/store. Adding trees and increasing green all over the lot. Owner is not a developer it is the guy whose family has owned it for 80 years..deep ties to community…not a build and leave..it will compliment the area..guy is putting his heart and soul into it. No offense Anthony but folks in Providence have heard that before… I would worry about the stacking of cars waiting for the drive through. The one on North Main Street (it is a shell with a dunking donuts tacked onto the side doesn’t do too bad, but that’s a much bigger faster moving road than this intersection, which even without the drive through, can get kind of congested.